Glass Top Metal Garden Patio Accent Table from Collections Etc. $59.99 $34.97 Save up to 42% Now! 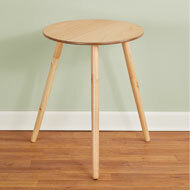 Indoors or outside, this side table makes a beautiful and handy chairside companion or display stand. It features a scrolling iron design and a glass table top. Iron & glass. 20"Sq. 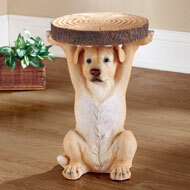 x 18 1/4"H. This item can only be shipped to the 48 contiguous United States and cannot ship expedited. Cannot ship to P.O. Boxes, APO/FPO. 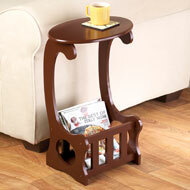 Just the right size for tight spaces, this accent table is perfect for holding magazines, remote controls and more. 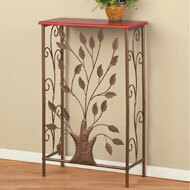 With a beautiful finish, it's perfect just about anywhere in your home. Wood. 13 3/4"L x 9 1/2"W x 24"H.